The Phi Beta Kappa Association of Greater Tucson came into existence in 2001. Alpha of Arizona PBK Member Hugh Rose was one of a handful of people who met several times that year to discuss the possibility of creating an Association for the Tucson community. With Hugh’s dynamism, knowledge of organizational principles and practices, and his commitment to the arts and sciences, he was highly instrumental in getting our project off the ground. And running: Hugh Rose served as our first President for several years, and after Don Tempkin was selected to take over the Presidency, Hugh has continued to serve on the Board of Directors and helped guide the Association to its present success as a community organization. 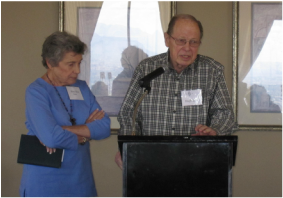 Several years ago, Hugh and Mary Rose created a substantial endowment for the Association. Their generosity has ensured that the Phi Beta Kappa Association of Greater Tucson will continue to do its worthwhile activities in service to the educational system in Tucson. We engage in many activities, such as high school and University of Arizona scholarship grants, regular talks open to the public by distinguished speakers, support of the University of Arizona Honors College, and community outreach. Our activities are possible in large part because of the commitment of two special people, Hugh and Mary Rose. We are so very grateful. The following members of Phi Beta Kappa Association of Greater Tucson have made an annual $100 donation to our scholarship fund. This amount is in addition to the annual membership dues. ​Thank you to all our Patrons for doing your part to support the liberal arts and sciences in higher education!